Theodor H. Winkler was born on 6 June, 1951. He studied political sciences and international security at the Universities of Geneva and Harvard University and at the Graduate Institute of International Studies in Geneva. He obtained in 1981 a PhD in political sciences with a thesis on nuclear proliferation. 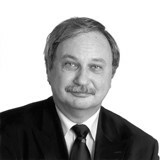 Winkler joined the Swiss Department of Defence in late 1981 as an inter­national security expert. In 1985 he was appointed Representative of the Chief of Staff for Politico-Military Affairs, in 1995 Head of the newly created Division for International Security Policy. In 1998 he was promoted to the rank of Deputy Head, Security and Defence Policy. Winkler has been, on 13 June 2000, appointed by the Swiss Federal Council Director of the Geneva Centre for the Democratic Control of Armed Forces (DCAF) and promoted to the rank of Ambassador. Winkler’s professional affiliations include membership in the Geneva Centre for Security Policy, as well as membership in the international Advisory of several other academic and international bodies.